For the first time Moscow analysts have issued precise estimates of the ferrous scrap sold in the domestic Russian market by the major scrap companies, and identified the market shares of the leading companies by name. The disclosures also confirm that the state-owned Russian Railways (RZhD) is one of largest scrap producers and traders in the market, trailing three of the large steel groups – Novolipetsk, Magnitogorsk, and Evraz – but far ahead of the scrap operators which are independently owned. Reliable is not, however, the term to use for volumes of scrap either in the domestic or export trade. What is missing is not only a measure of the size of the black trade in scrap, but also the reluctance of everyone, including the industry analysts in Moscow, London, and Washington, to acknowledge, let alone count the value of what is going on. The newly disclosed data make a sequel to this week’s analysis of the future of scrap in the Russian steel market. For that story, click here. Steel scrap is the mineral reserve above ground which is collected from old cars, ships, building parts, machine parts, and household goods, as well as waste from steel smelting processes. If it isn’t collected, it deteriorates in the open air at a loss rate of about 2 tonnes per 100 tonnes per annum. Sorted, cleaned, and compacted, it becomes essential feedstock for the electric arc furnaces (EAF) which produce long steel products for the construction industry. Long steel products include the bars (below, left) and wire mesh which reinforce poured concrete; and beams (right), sections, angles, and plates which hold structures intact from foundation to roof. The EAF type of smelter and the long type of steel comprise the fastest growing segment of the steel market in Russia, making supplies of scrap vital for the future of the major steelmaking groups, as well as for smaller, regional steelmills which are being developed to meet regional market needs for construction steel. The World Steel Association (WSA) compiles production data for crude steel and for the major products finished from this base metal. But its data tables are lagging by a year. In 2012, the WSA says that Russia turned out 21.8 million tonnes of crude steel from EAFs; in 2013 the number was fractionally smaller at 21 million tonnes. In global terms, this volume put Russia behind China, US, India, Japan, South Korea and Turkey. The WSA reports exports and imports of scrap for these countries; it does not report domestic production or consumption of scrap. Russian and international steel experts say they aren’t quite sure how much scrap goes into Russia’s EAFs. From many data reports, it appears that more scrap is recorded as consumed at the steelmill or exported at the border, than is recorded as having been produced at the scrapyard. In 2012, about 29 million tonnes of scrap were consumed; 5.5 million tonnes were exported; 25 million tonnes were collected; and zero tonnes were imported. That’s according to Oleg Maslennikov, managing director of Itsok Corporation, a Moscow-based metals consultancy and publisher of Ruslom.biz, a newsletter specializing on scrap. So another 5 million tonnes of scrap must have been produced and delivered to the steelmills. Asked for Russian scrap production estimates, other experts give a range of 24 to 34 million tonnes. The tonnage totals for 2013 and 2014 indicate that scrap collection has been declining since 2012 by about 5% per annum, while demand from new EAFs has been growing. Construction of new EAF steelmills has largely been completed, and this year, with a sharp fall in construction, it can be expected that demand for scrap will fall. .
Imprecise and incomplete as the tonnage figures are, the value or sales revenue for Russian scrap is missing almost entirely. Prices are volatile in both domestic and export markets, and over the past two years have been falling. Based on export data, between 2012 and the start of this year, Russian scrap has ranged between $200 and $400 per tonne. In theory then, Russian scrap is worth between $5 billion and $7 billion at minimum price; $10 billion and $14 billion at peak. Exports should be earning at least $1 billion a year. Because of technical differences between electric furnaces and quality of scrap, it isn’t easy to estimate the volume of scrap required to produce steel. According to reports from Novolipetsk Steel (NLMK), in 2014 it delivered 4.43 million tonnes of scrap to its EAFs and turned out 2.6 million tonnes of long products. The ratio between them is 1.7 to 1; in other words, it takes 1.7 tonnes of scrap to produce a single tonne of long steel. Other estimates suggest that the ratio is closer to 2 to 1. This ratio is useful, because in Russia the measure of steel that is poured out of the electric arc furnaces is more certain than the measure of scrap fed into the furnaces. So when WSA reports that steel production from EAFs in Russia totalled 21 million tonnes in the years 2012 and 2013, the ratio can be used to calculate what volume of scrap feedstock was required. With a ratio of 1.7, the scrap volume turns out to be about 36 million tonnes. 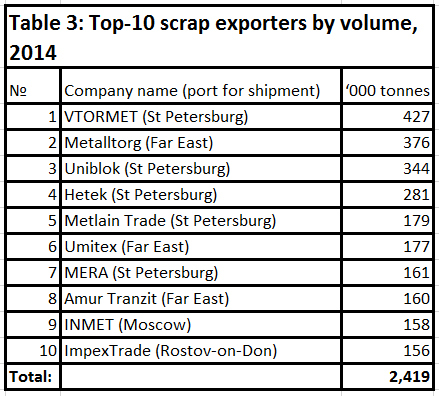 Adding the scrap exported, there appears to be more scrap in Russia than anyone’s counting scheme has revealed. Explanation: the ratio may be wrong, or the scrap business is bigger, and more valuable, than it wants to acknowledge. 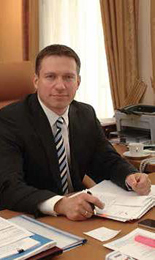 Two Moscow- based consultancies specializing in the Russian metal markets, Rusmet and Istok Corporation, monitor the steel markets constantly, and publish their results on their websites – Ruslom.com for Rusmet, Ruslom.biz for Istok. Look again at the bottom line of the table. The grand total is only 17 million tonnes. But if production of scrap that year was reported to have been between 24 and 34 million tonnes, this means at least another 7 million tonnes, perhaps as many as 17 million tonnes, are not accounted for. That in turn means a very large number of small scrap producers are filling a very large black hole. Alternatively, hiding behind a great many small names with small volumes, there are a few large names who are bent on concealing how much business they actually do. In short, two black holes – one for scrap volumes, one for scrap revenues. The numbers in the volume column are relatively small in relation to the total scrap tonnage recorded, which means the companies are relatively small in size and turnover. There are no oligarchs in the Russian scrap business; the oligarchs of the steelmills have made sure of that. That is, except for Russian Railways (RZhD), which is controlled by Vladimir Yakunin (lead picture, upper right). In the Istok tabulation, RZhD ranks fourth in the scrap supply sector behind the three steelmakers — NLMK, Magnitogorsk Metallurgical Combine (whose scrap unit is Profit), and Evraz. Istok’s analysis of the export trade in scrap reveals, once again, a bottom-line total which is significantly less than the total volume of exports recorded elsewhere for the year – perhaps half as much. The World Steel Association says that Russian exports were 4 million tonnes in 2011, 4.4 million tonnes in in 2012, and 3.7 million tonnes in 2013. 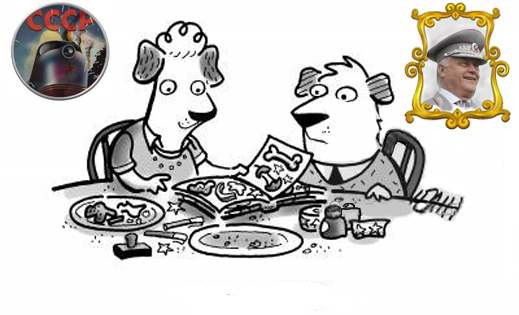 Click for these data at Table 53 here. 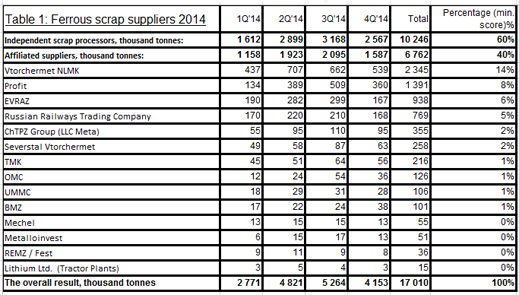 CRU analyst Dmitry Popov claims the export volume in 2014 was about 4 million tonnes. There are 15 branches of the company for collecting and selling scrap, according to this presentation. The volume of scrap is “substantial”, the website says. The website doesn’t reveal what an industry source reports – when RZhD exports scrap, it does so through MERA, which in turn has a contract with a subsidiary of RZhD called TransLom. But MERA is reported to be exporting only through St. Petersburg, in the northwest. 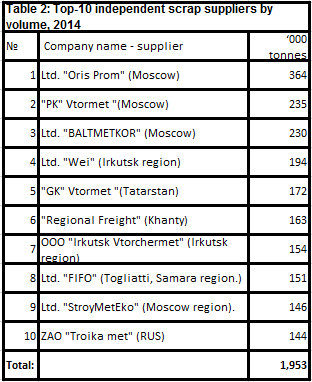 How about RZhD’s scrap exports to South Korea through Russia’s fareastern ports? No industry expert is able to say. South Korean importers in Seoul acknowledge buying rail scrap from Russia, but they won’t say who supplies it. RZhD’s trading company is headed by Kirill Voronin (right). Who is in charge of the scrap business is not disclosed. The press office, headed by Elena Kochubey, says it stands for “openness, a professional approach, responsiveness and readiness for dialogue are the key principles on which we build our work at the Press Centre.” The company website says that in 2011 more than 1.2 million tonnes of scrap was collected. In 2013 the number reported was “more than 1.26 million tonnes.” Between 2010 and 2013, the company claims to have collected “more than 5.7 million metric tonnes of recoverable materials”. These numbers do not distinguish between steel scrap and copper and other non-ferrous scrap. Kochubey was asked to say what the tonnage was of RZhD’s steel scrap collection in 2013 and 2014. She promised to deliver, and then replied the information is confidential. RZhD’s scrap is a closed book.